Have you checked your pantry recently? 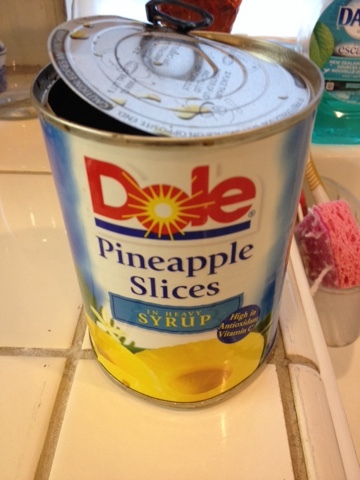 To my surprise, even after several checking through past months to make sure that there is no expired canned food sitting, I found this can of pineapple with its lid blown opened. What's in it is a mystery that I did not care to venture further and a peek was enough to see that it needs to be tossed immediately. How about your pantry? 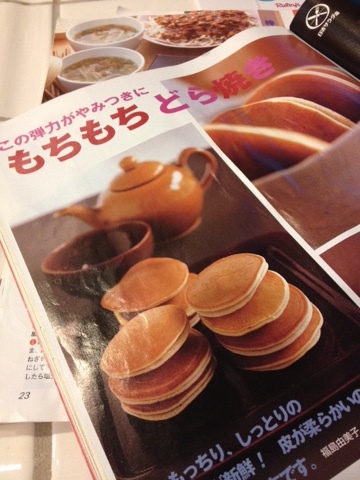 This pastry looks like a pancake, but it's more like mini Japanese KASUTERA cake in round shape filled with sweet Red Beans. 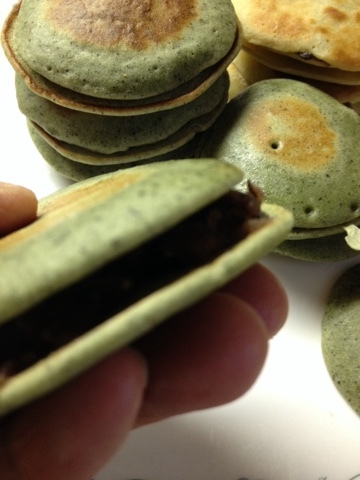 DORAYAKI is a pastry filled with sweet red beans sandwiched between two round thin cake. This type of pastry as I recall is a specialty that we buy from stores. Japanese kitchen back 50 some years ago did not come with modern kitchen equipment as we know today or even available. The most high tech gadget was the electric rice cooker. It's almost like everything we ate and sold were made by family of that trade and by tradition. 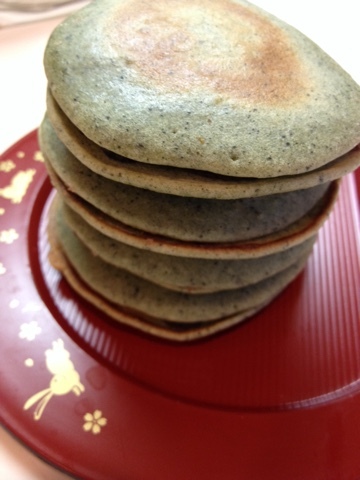 The store bought DORAYAKI is actually waaaay too sweet for me. So when I saw the recipe in the magazine and on Internet, I gave it a try. 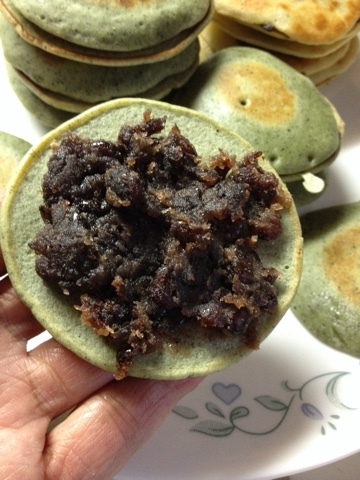 The first recipe included MOCHI powder. The recipe was tested by the magazine's test kitchen staff in search for crispy outside, chewy soft inside pastry. How did it turn out with mine? Naaaa, even though I opened and used the expensive SHIRATAMAKO (sweet rice granules), the recipe method did not fare out as I had hoped for. I added YOMOGI powder after first round to add more flavor. Basically, the cake remain quite flat even with a teaspoonful of baking powder. Back to drawing board to retest. I used Greek plain yogurt mixed with milk instead of sour cream for this one. The result is just as good. 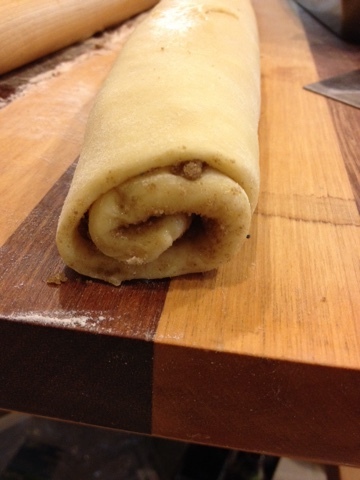 If you started forming dough at night, roll the dough out, spread 2 to 3 Tbsp of softened butter across the rolled dough. 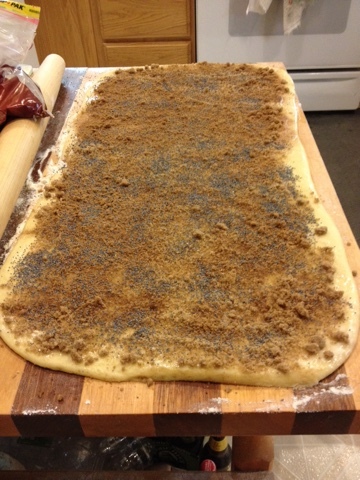 Spread brown sugar 1 to 2 C and 2 Tbsp Ceylon Cinnamon across. 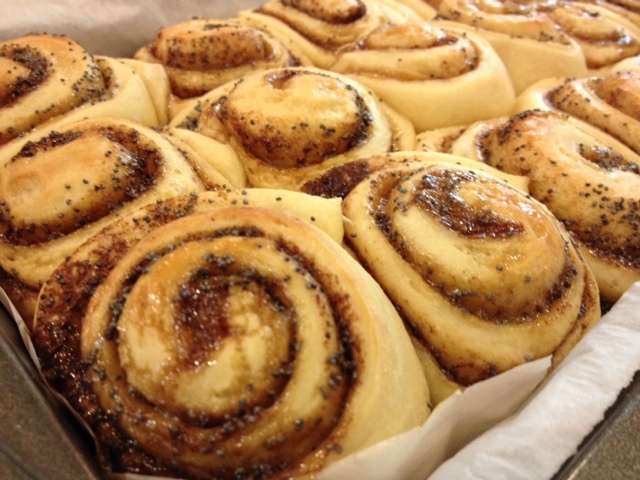 Sprinkle poppy seeds as much you like. 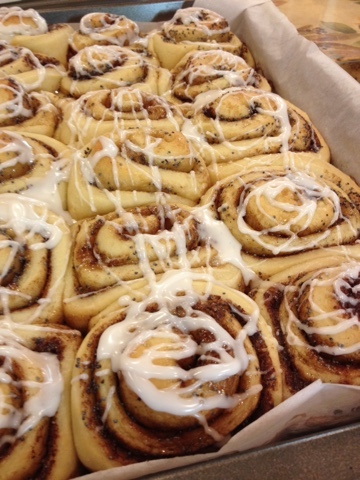 Start rolling the dough. 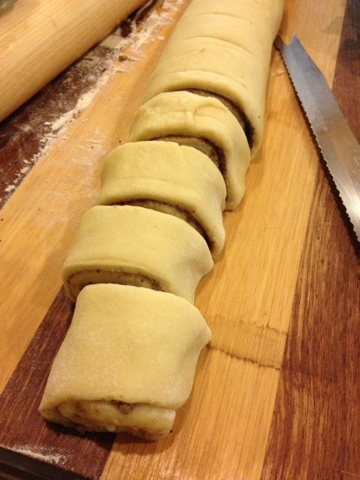 Roll up just tight enough - not too tight or not too loose that fillings would drop out when the cut piece is placed in baking pan upright. 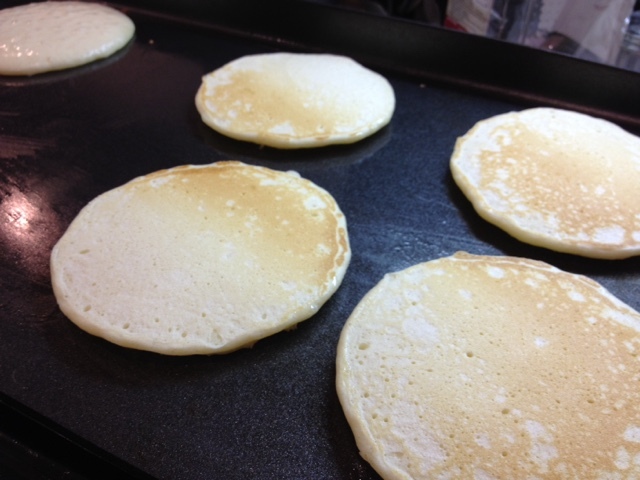 Line a cake pan with rim with parchment paper. Use serrated knife and slice. *18 slices for 9x13 or 12 for large tall size - use brownie pan. 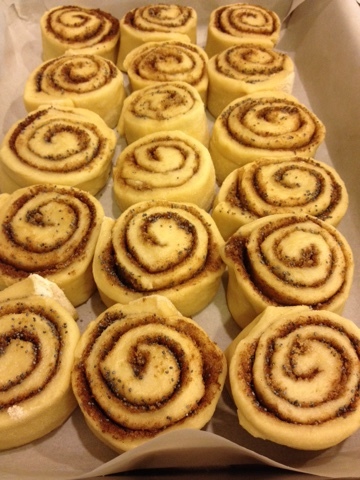 Place the sliced ends in center and start filling the baking panfrom center out. 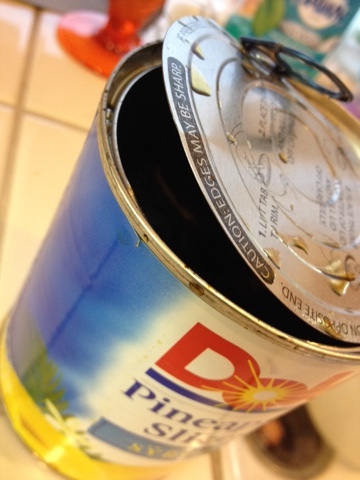 Cover the pan with plastic slightly sprayed with vegalene and a air tight lid and refrigerate over night, if desired. Take it out 1 to 2 hours ahead to complete the rising. Preheat oven to 350'F. 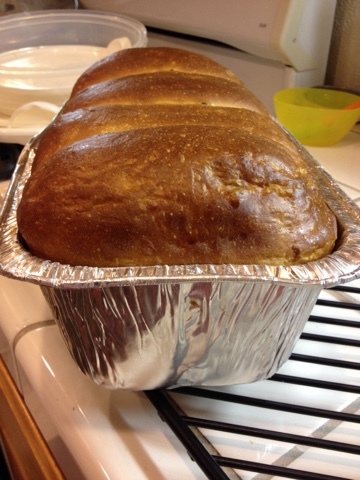 Cover with Foil and bake for 15 minutes. Prepare frosting - 1/2 C powder sugar + 1/2 tsp milk. 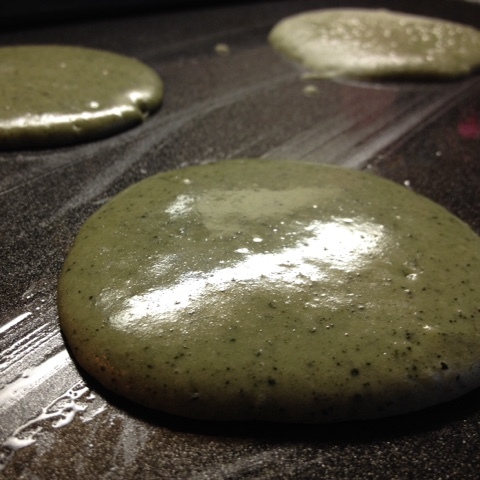 Adjust consistency by adding more powder sugar or milk. Remove the foil and bake 10 more minutes.....depending on the size of the slices. Use baker's thermometer to check dough's temp for doness. I am not looking for browning on the top. If you do, your rolls texture will be 'dry'. If the dough at center reads at least 185'F, depending on your oven's BTU, it's done. Remove from oven and drizzle with frosting, if you wish. Enjoy! 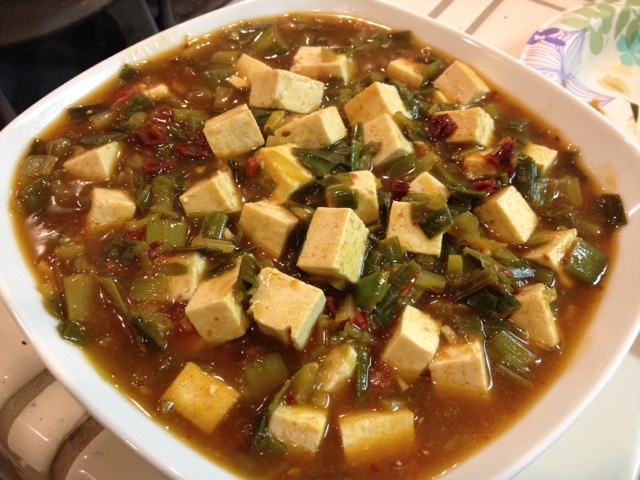 This is one of my favorite recipe I enjoy. 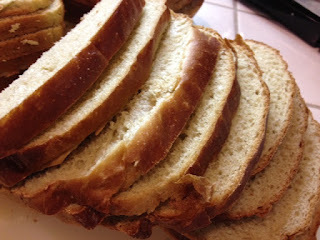 Sometimes when I am really tired I want to just grab a bread at the store and just bite into it. 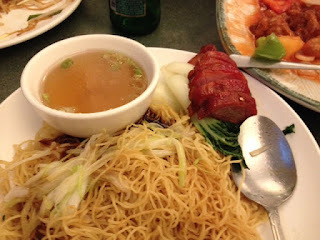 But considering how my body has been reacting to some of the processed food, I restrain myself often. I wished the manufacturer would wear a new thinking hat and start new processing method with less preservatives and modify their sales coverage to think "local". 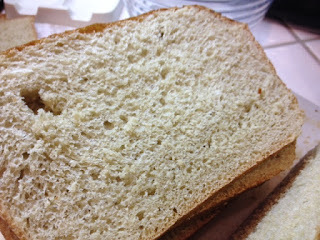 Interesting part of this bread is that when it baked, the natural green color oxidized just like when drinking tea and is brownish light tan in color. 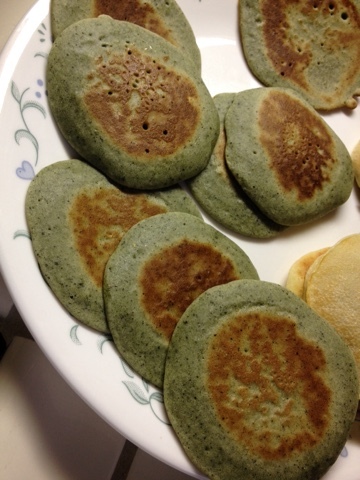 But after several days in refrigerator, the color looked more greener. Can't quite figure that out. Maybe because of my camera's filter setting. One slice of this bread would fill you up. 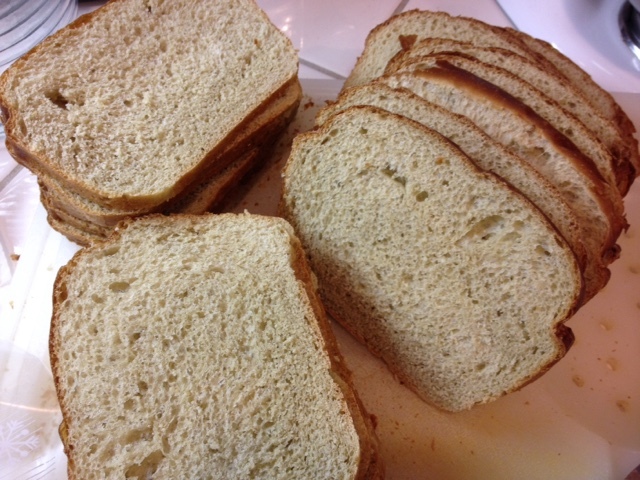 It's light, but it's equivalent to three slices of regular store bought breads. 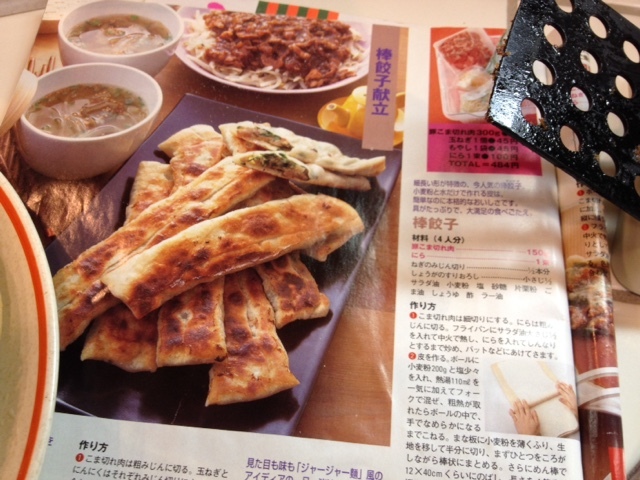 It's fun to cook out of Japanese Magazine called Orange - "O REN JI"
There are varieties of recipes of pastries and main dishes that normally would had been just purchased from the stores (back in the old days). 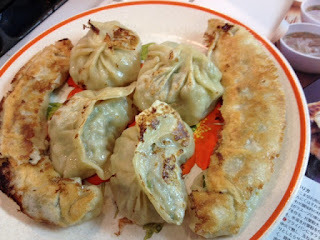 I made the meat filled dumpling in the shape it described and into couple of other familiar shapes. It was fun. 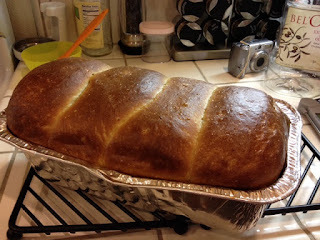 What I liked about this recipe is the result of the skin. It turned out really nice. It's another keeper. 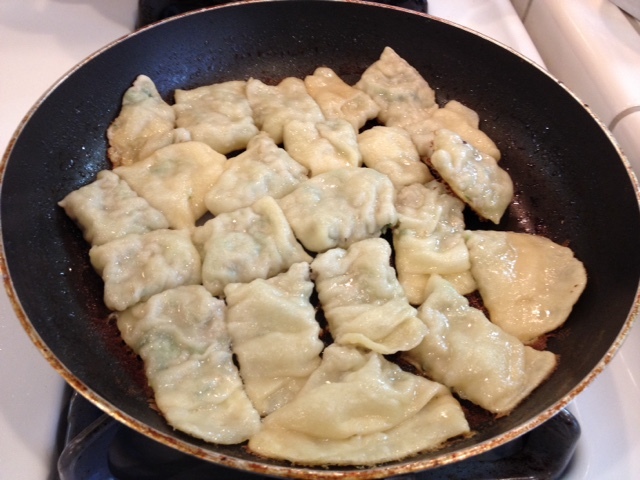 I normally cook only one side, but for the test I fried the other side a bit. 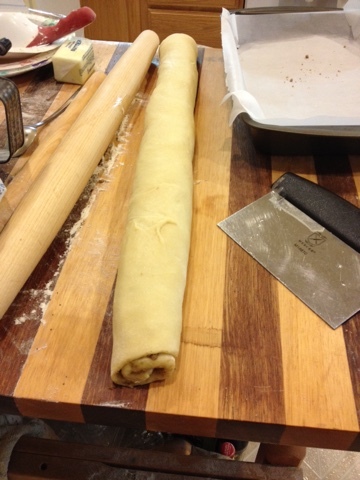 And while rolling out another batch, an idea came and I cut the baton shaped dumpling with Ravioli cutter. Voila! 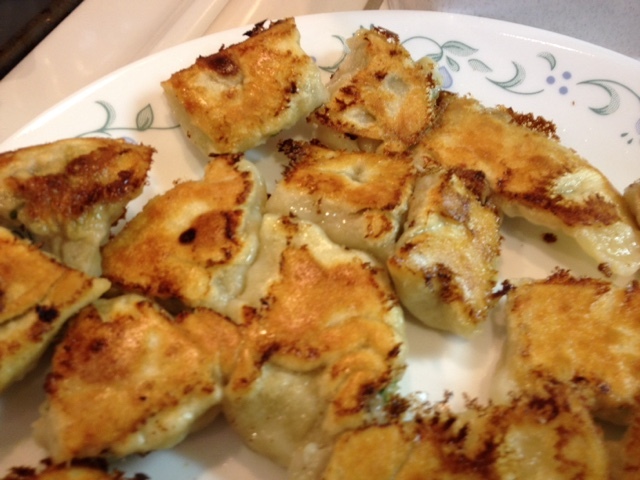 A bite size GYOZA. 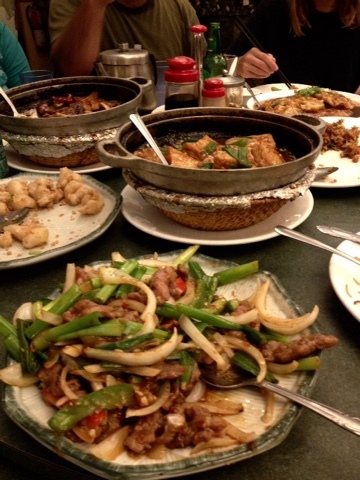 It's rare that I venture into a restaurant by myself in Sacramento area, unless recommended by my friends. Opportunity came last Friday when we had a welcoming late dinner for one of our visiting Kendo Sensei (instructor) from New York. Whoever could make it attended the 11 pm party. Yo my surprise, the dish is well prepared. 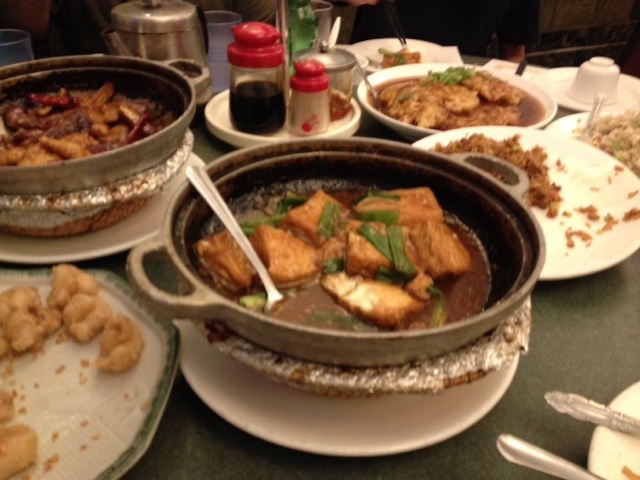 I did not eat much as it is 11 pm, but all the dish my friends ordered looks good and everyone enjoyed them well. 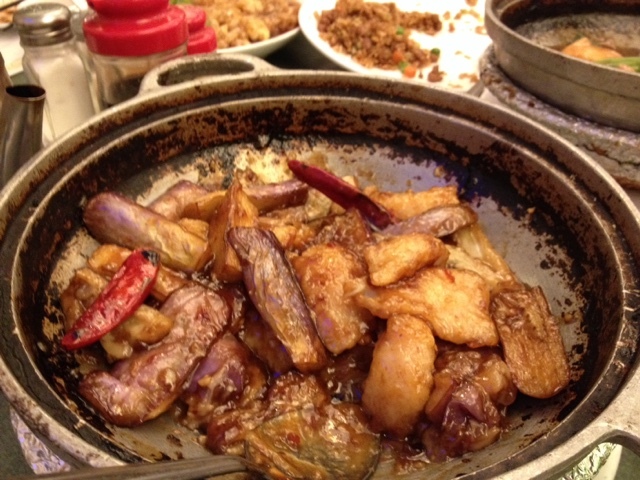 I tasted this eggplants with cod in claypot, braised TOFU, they were delicious. It reminds me of New Yong Kang restaurant in Fremont (our family's favorite restaurant in the Bay area.) 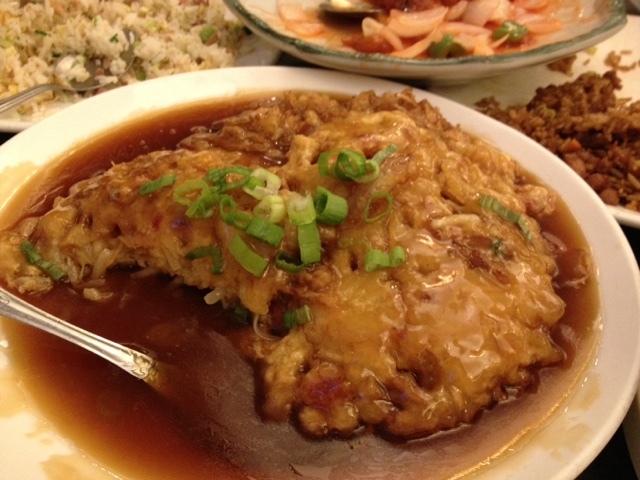 New Lai Wah is located in 5912 Freeport Blvd., Sacramento, CA 95822 they are open from 11am - 1 am!! I want go back there for lunch. 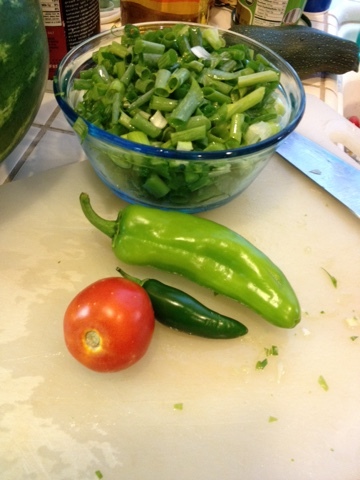 This dish's ingredients are from my friend's garden and mine. A couple of items are from the store. 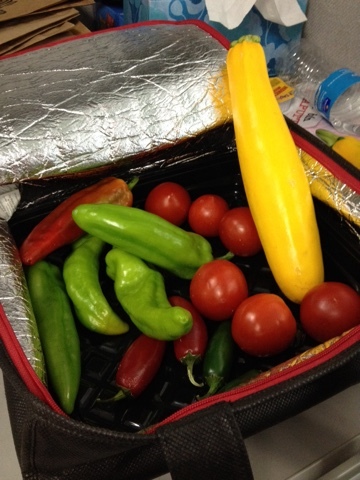 We are so into this Farm to Table that I call this Garden to Table (GTT). I am sure you have your own favorites, too. 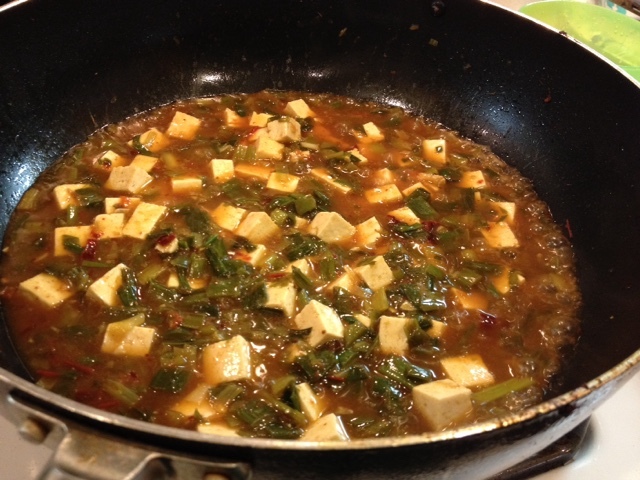 It looks like a MAPO TOFU dish, but The dish turned out to be like a TOFU stew. It's good to have a consistent result from your favorite recipe. 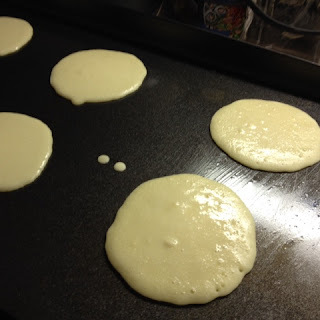 This is third time I am making this for my beakfast I hope you found a good scratch recipe for your family, too. I like this buttermilk pancake ingredients. Shift flour again with heaping 1/4 tsp of Baking powder without Aluminum and 1/8 tsp of Baking Soda. 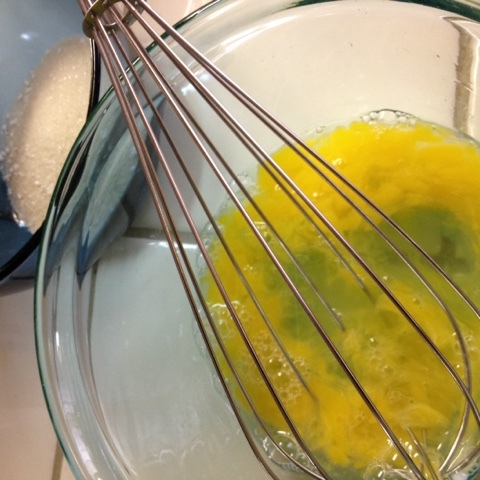 Whisk 2 Large Eggs, (extra large eggs are okay, too) and 2 Tbsp Organic Cane Sugar, 2 Tbsp Melted Butter. 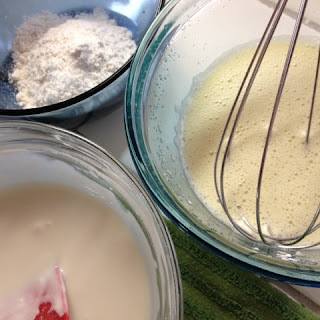 Whisk till quite light (2-3 min.) 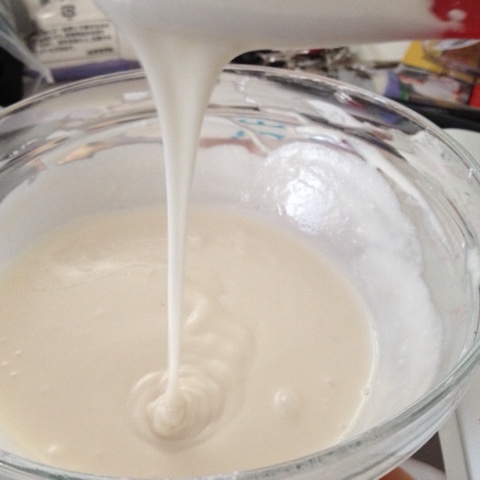 then add 1-1/4 C Buttermilk. 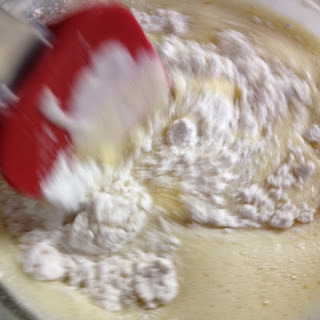 Shift in flour mixture 1/4 C at a time. 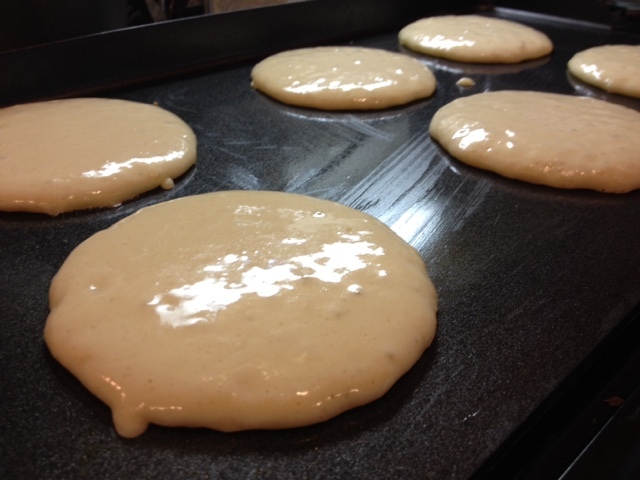 In the meatime, heat griddle to 350'F. "Coat" the griddle with vege oil with brush. 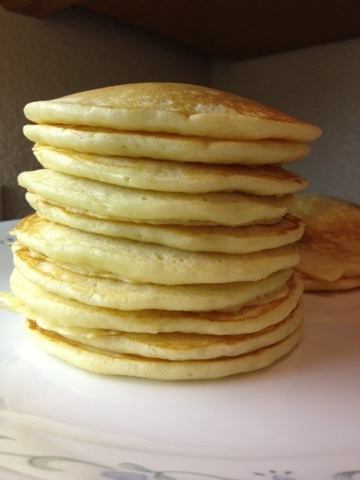 Drop batter to the size you like. 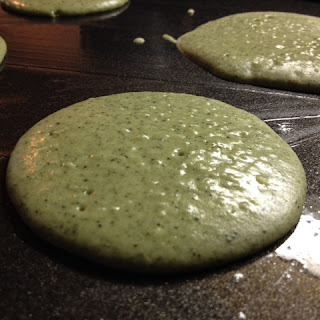 One of the fun in cooking is to test with new gadget. 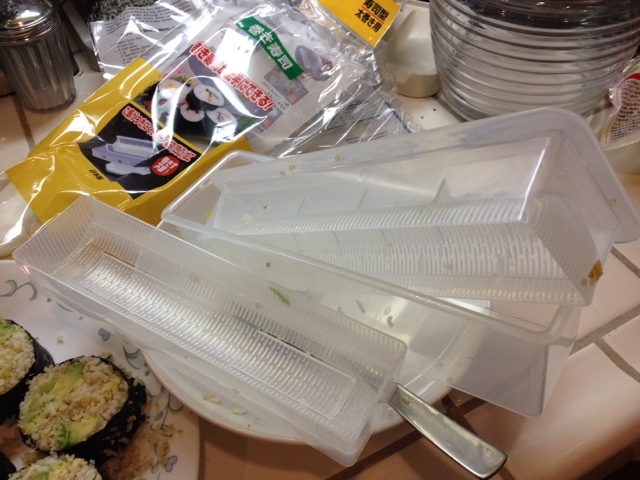 For $1.50 this Japanese FUTOMAKI Gadget proved its worth. I had my bamboo roller out and ready to roll with but I remember having purchased a roller at the DAISO. Here is my result. 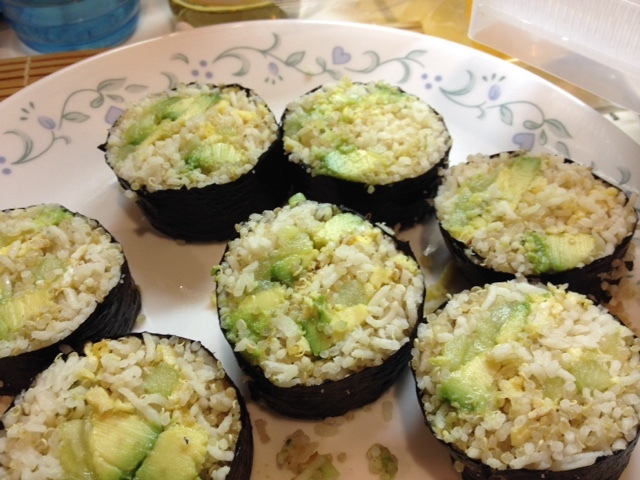 By the way, it would turn out much better if you use the regular short grain rice. 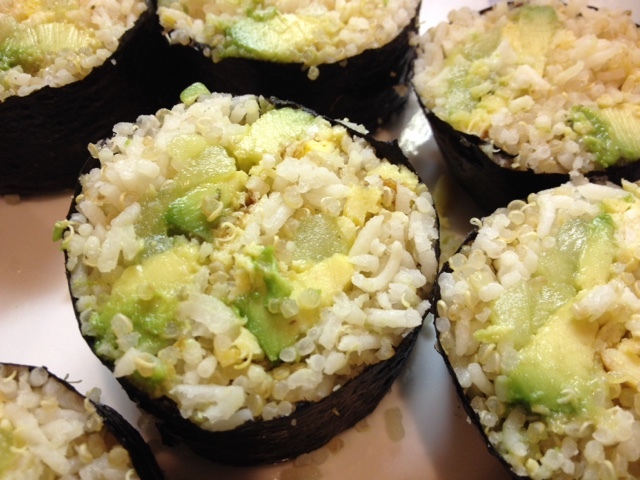 I have been eating extra long grain Basmati rice cooked with Quinoa so that's what I used. The test here is to see if the roller is worth trouble using it or make it the old fashion way. 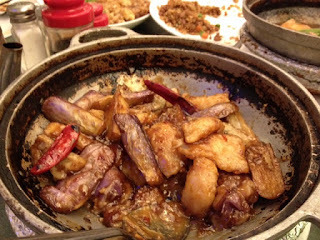 Ingredients would be cooked rice, cooled, seasoned slightly with sweetened rice vinegar. 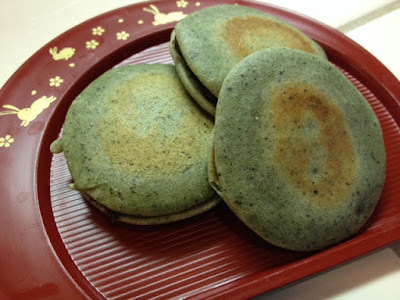 Two sheets of NORI seaweed wrapper. One egg beaten with pinch of salt and 1/4 tsp of sugar and 1 Tbsp of water. 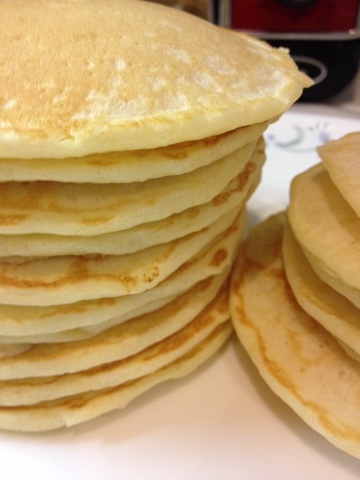 Fry the beaten egg into crepe over a lightly coated frying pan (non stick frying pan works out the best for this job), after it is cooked and cooled, transfer to the cutting board and julienne slice into 1/4" wide. 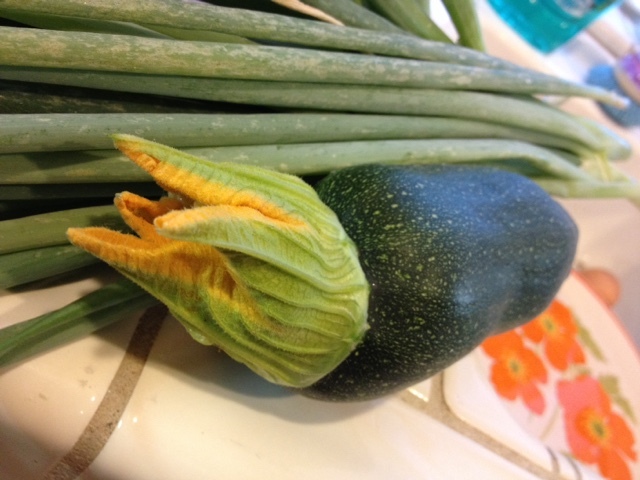 Julienne cut a cucumber 1/4" wide - leave out the seedy core. If you would like a crunchy cucumber, squeeze the cucumber between palms of your hands. Squeeze as much liquid as you can. You can leave it as is also. Sliced avocado and anything else you want. Place the bottom mol into the bottom box. 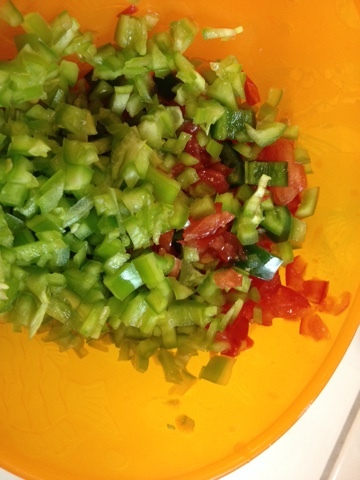 Fill the lower cradel with rice 2/3 full, then top with all the cut vegetables and egg pieces. Set aside. Line the top round mold with NORI, then fill with rice. 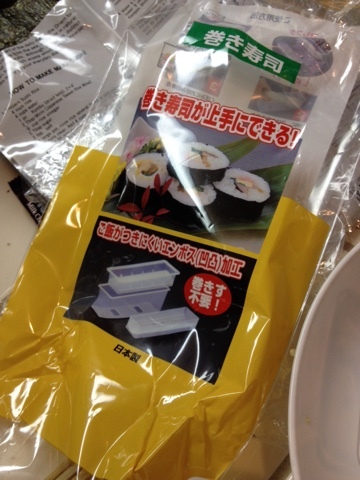 One side of the NORI will extend out of the mold. That's okay. 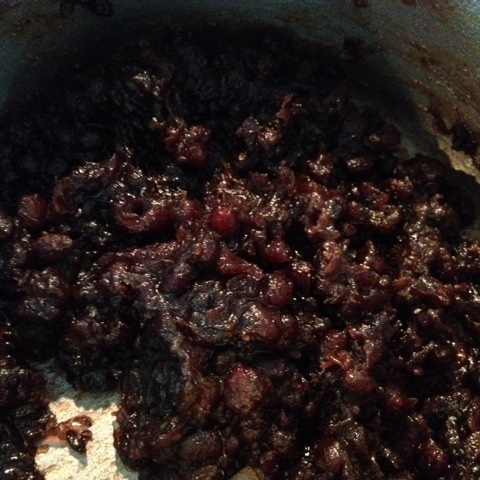 After filling with rice, press down with the back side of a soup spoon. 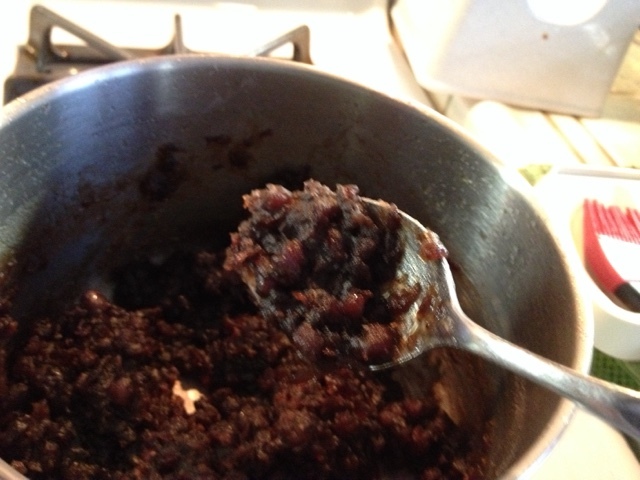 Place it on top of the bottom mold with rice and fillings. Revert the bottom out of the bottom box, then remove the box. Roll the NORI that was extending out over the bottom halves. Then cover it again with the bottom cradle. Uncover, Rotate the whole roll over a bit. Recover and press. Done! Not a bad Gadget. A keeper!